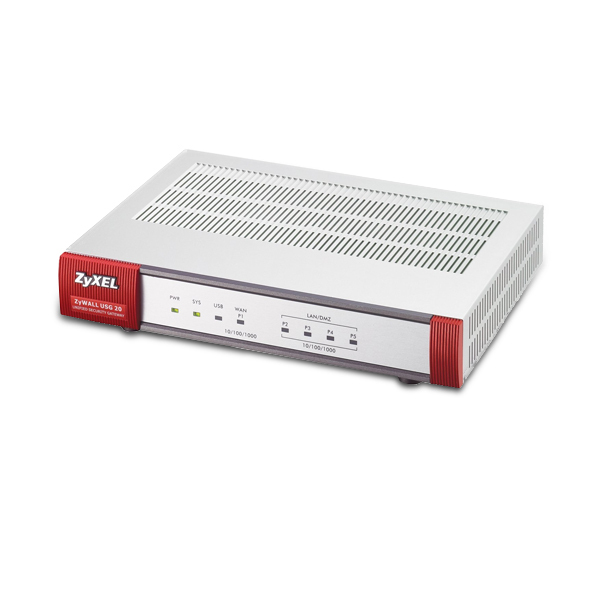 The ZyWALL USG20 is a Unified Security Gateway designed to provide complete, enterprise-level advanced security solutions to Small and Home Office networks, recommended for up to 5 PC users. Its flexible configuration is designed to help network administrators efficiently set up, manage, and enforce network security policies. The USG20’s web-content filtering engine goes a step beyond simple URL blocking. It allows users to manage the level of content filtering, giving complete control over what types of websites that can be accessed on the network. Administrators can choose between BlueCoat and Commtouch web filtering services. To further defend networks and provide greater control and ease of use, the USG20 also employs an anti-spam service to flag and discard commercial and unwanted e-mail messages, protecting important information from getting lost in the clutter. Application Patrol gives you detailed control over the applications allowed to run on your network, while the built-in 150Mbps throughput firewall and web-content filtering protect your network from DoS attacks, phishing, and other threats. 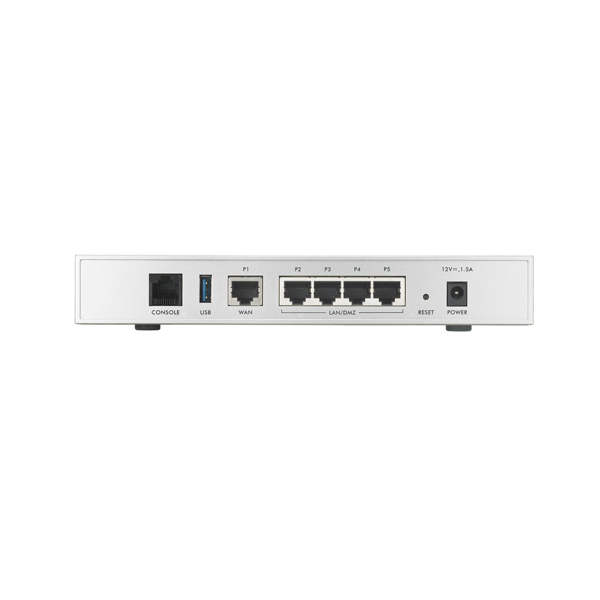 Built with powerful Integrated High Performance Security architecture designed for Gigabit connections, a VPN throughput of 75Mbps, up to 6,000 max sessions and 5 concurrent IPSec VPN tunnels, the USG20 has the power to monitor and protect your network without sacrificing network performance. The USG20 is designed to allow secure VPN connections no matter what device or network settings are being used. IPSec VPN support allows secure connections to branch offices, partners, and headquarters; road warriors and telecommuters can use SSL to securely access the company network without having to install VPN software. The new ZLD3.0 firmware upgrade enables L2TP support on all USG devices, making it easy for Android, iOS, and other mobile devices to establish VPN tunnels to remote networks directly from their native settings. The USG20’s network optimization functionality makes it far more than a network security device. Bandwidth management options let administrators prioritize latency-sensitive applications like VoIP and videoconferencing, ensuring high-quality connections without lag or performance issues. 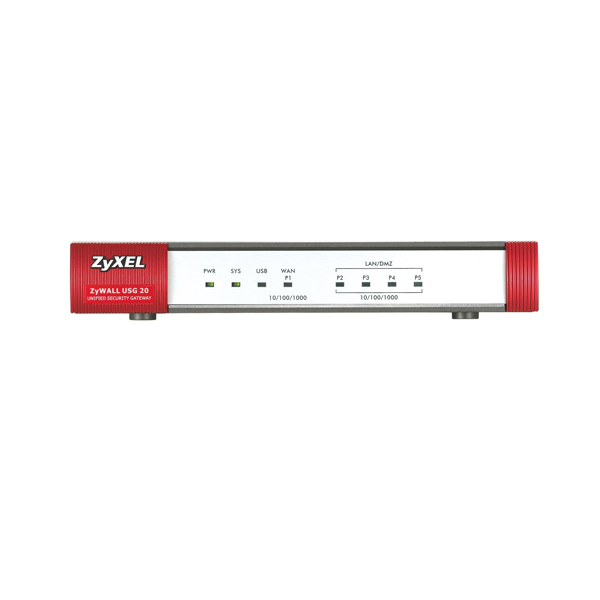 The USG20 supports the use of ZyXEL’s Vantage CNM and Vantage Reporting software, allowing centralized management and monitoring of multiple ZyWALL devices on a single network. Vantage Reporting offers a comprehensive set of real-time and historical reports including firewall attacks, bandwidth usage, Website usage, and more - all organized into an automated, easy-to-read format that can be viewed from anywhere. Administrators can use this data to easily identify security problems and their causes and take prompt action. Vantage CNM provides a suite of diagnostic and management tools that allows management of multiple ZyWALL devices from a centralized interface, reducing the time, cost, and complexity involved in VPN and security management. VPN monitoring allows network administrators to actively troubleshoot VPN problems as they occur, while centralized configuration of UTM functionality allows network administrators to manage license subscriptions, update devices, and isolate and repair security problems across all ZyWALL devices on a network. The ZyWALL USG Series delivers industry-leading email protection against spam, phishing and virus-laden emails, powered by Commtouch. The high performance Commtouch technology comes from the unique recurrent pattern detection (RPD) mechanism that scours millions of new patterns each day (24x7x365) to block spam messages in real-time. In addition, the ZyWALL USG applies sender-based IP reputations to remove over 80% of unwanted mails and to offer zero-hour virus outbreak protection, capable of blocking or delaying suspicious messages hours before commercial anti-virus signatures are available.